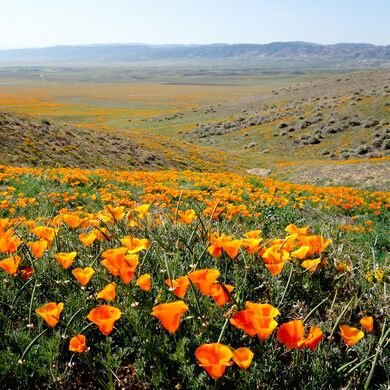 Walking along the eight miles of trails in the Antelope Valley California Poppy Reserve, you might feel like Dorothy in the Wizard of Oz with the carpet of poppy flowers stretching out before you. The high desert landscape in the Mojave Desert is protected by the California Department of Parks and Recreation for its floral beauty. Poppies are the California state flower, but nowhere else in the state are the blooms so stunning and vibrant. The flowers usually return in mid-February and last to mid-May, although it depends heavily on the rainfall. While the reserve is known for its poppies there is also an abundance of yellow flowers called Gold Fields. These little flowers are source of the wide swaths of yellow seen on some of the hills. Since the 1970s, grazing animals have been kept away and people visitors are prohibited from taking any souvenirs, but aside from that the poppies are left completely to their natural splendor. 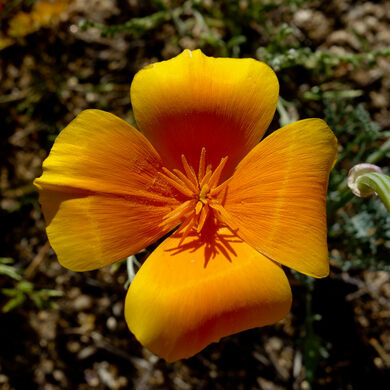 During the spring, bloom status updates are posted on the state park website every Thursday.The reserve is located 15 miles west of Lancaster. When getting close to the reserve, if you see lots of cars parked along the side of the road that means the parking lot is full. There is no fee for walk-ins.No dogs are allowed. A part of the world's largest marsh seems to be growing bright red Martian grass.